I’ve always thought first direct was a pretty cool and innovative bank. I still do. I was actually one of the first customers to open an account with them years before I worked on their digital marketing at MadeByPi. Banks and cool aren’t two words that usually sit together but Coolbrands – the annual initiative to identify the UK’s coolest brands – agreed with me. 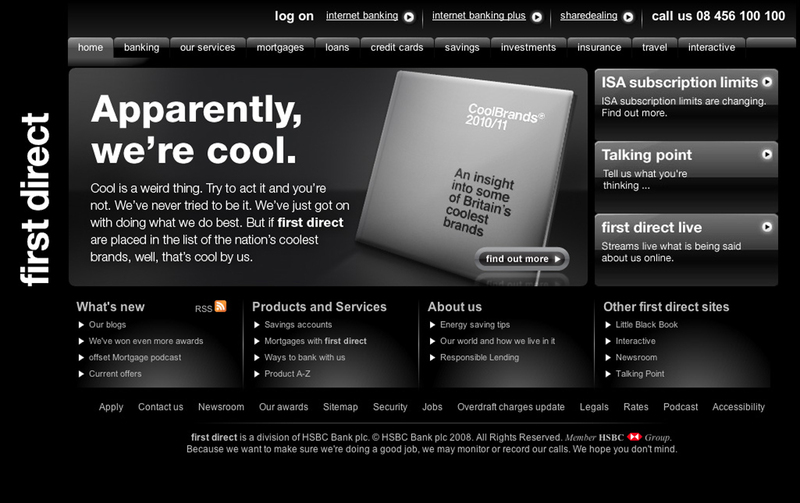 This self-deprecating banner I wrote announced the unexpected bank’s Coolbrands status. Cool is a weird thing. try to act it and you’re not. We’ve never tried to be it. We’ve just got on with doing what we do best. But if first direct are placed in the list of the nation’s coolest brands, well, that’s cool by us.